Bee Nice to Bees with Pollinator-Friendly Plants! | Gardens Alive! When I first started working at Rodale Press in the 1980s, Bob Rodale (then the editor of Prevention and ORGANIC GARDENING magazines) would always stress that we should never bring up a problem like high blood pressure or tomato hornworms without offering some solutions (like calcium and exercise and Bt and handpicking, respectively). My interview with author Rowan Jacobsen on today's show reminded me of Bob's policy. Rowan's new book, "Fruitless Fall" paints a potentially grim picture of the future if we don't try and nurse our imported honeybees back to health and protect our native bees from the same threats that have decimated honeybee colonies. That's why I was pleased to note that the book ends with a plea for homeowners to consider plants on the basis of their value to pollinators. On one hand, its pretty simple stuff: Plants whose flowers produce lots of pollen and nectar are good for bees—and sometimes attract other super-cool pollinators like butterflies and hummingbirds as well. But how can we tell which flowers do that, and which ones, while still very pretty, have all the nutrition of iceberg lettuce? And what about color and aroma? In general, choose older varieties over modern hybrids; especially if those hybrids have been bred to not produce pollen (for cleanliness when the flowers are cut) or if the scent has been bred out of them on the path to producing showier blooms. Go native! On average, says Rowan, native plants produce four times as much pollen as non-natives. And your native bees have been visiting those native plants for centuries. Have something in bloom at all times. 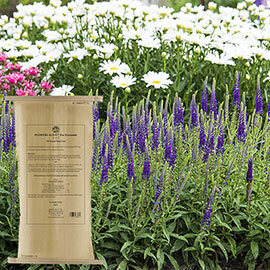 This also helps insure a steady stream of the beneficial insects that prey on bad bugs. Mix it up. A garden with flowers in all shapes, sizes and colors will feed lots of different types of pollinators…. …but also think big. Plant flowers of the same color in blocks, so that their bee-attracting color is visible from further away. Don't use lawn chemicals or other pesticides. (D'uh!) If you're tempted to spread or spray something nasty, please check our archives first; I bet you'll find a non-toxic (and more effective!) solution there. Provide some starter homes. Drill holes into blocks of wood for mason and carpenter bees, or buy pre-made bee houses that cater to these helpful buzzers. Fill an old coffee can with drinking straws and hang it sideways from a tree; many native bees love this kind of housing. Leave a nearby area wild for bumble and other bees that like to nest in tall grasses. OK. Now the plants. Rowan's book includes eight pages of flora recommended by the USDA's fabulous Logan Bee Lab in Utah) that provide the size, shape, color, pollen and nectar bees like best. Now, there are hundreds of species of native bees, some common across the country and some very localized. 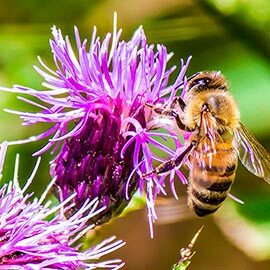 So consult local sources as well—or cross-reference the complete Bee Lab list with native plants that do well in your area. Obviously, we don't got time for me to mention every plant, so here's a sampling that are easily available, personal favorites of mine, and/or surprising in their pollinator power or added abilities. Visit the website of the Logan Bee Lab for the complete list. Or buy Rowan's book, you cheapskate! Dill, fennel and coriander (all three are also among the most excellent attractors of pest-eating beneficial insects like ladybugs and lacewings). Borage (another great one for beneficials, and an under appreciated beauty). Mustard greens (highly colorful, very spicy/tasty, and great attractors of beneficial insects). Rosemary, Lavender and heathers (false heather too). Watermelons, gourds and squash (including pumpkins). Sunflowers (just not doubled-flowered or pollen-free varieties). True mints (just keep these rampant growers under control!) and cat mint. oregano (but you have to let the plants flower to feed your bees, which lessens the flavor of the leaves for culinary use; so grow twice as many, some for frequent cutting and some for bees and beneficials). Tansy (Tanacetum species, not the noxious weed 'tansy mugwort'); tansy is also among the top five plants for attracting a large number of pest-eating beneficials, and is THE best at attracting aphid-eating lacewings. Wild violets and Johnny jump-ups. And virtually all fruit-bearing trees, canes, bushes and shrubs. Like we said, this is just a small selection of the bee-friendly plants you can play around with. We encourage you to seek out the entire list. Thanks very much to Rowan Jacobsen for his kind permission to condense, collaborate and confuse his words. Once again, the book is "Fruitless Fall", it's published by Bloomsbury, available wherever fine books are sold; and it—and this excerpt—is and are copyright 2008 by Rowan Jacobsen. Here's a link to the book and to Rowan's website.